Lees Supermarket is certainly a unique place. Family owned for generations. Independent. Rooted in the community. People feel the connection and they like it. Lees Supermarket is a neighborhood store in the very best sense of the word. How did it all get started? Back in the late 1940s, Al Lees, Jr. was a teenager living with his parents over the family’s fish market on Lees Wharf at the Point. In March 1949, Al, and his father, Al Lees Sr., opened a general store in a converted barn on the east side of Main Road across from where the Santos farm is today. The business, Albert E. Lees, Inc., sold mostly hardware, seeds, and fertilizer. In early 1951, an International Harvester outlet in Central Village went bankrupt and was put up for sale. The Lees went to the auction expecting only to bid on a few small items to add to their stock. When it came time to sell the building the auctioneer had trouble coaxing a bid from the crowd. The Lees put their heads together and made an offer. The auctioneer shouted “Sold!” Suddenly, Al Lees and his father owned a new store. They quickly got to work, fixing up the place, moving in stock. In November, 1951, they held a Grand Opening. The curious came through the door just to see what was happening. A steady stream of customers has been coming back ever since. Westporters associate Lees Supermarket with innovation. 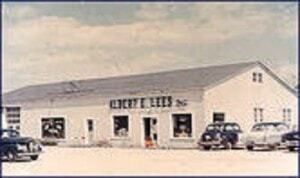 The 60 plus long history of Lees Supermarket is one of continuous growth and change. 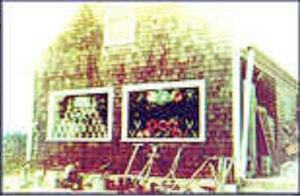 Lees started out selling general merchandise; hardware, clothing, toys, and such. No food. Throughout most of the 1950s, that’s where things stayed. Then the big discount outlets – like Ann and Hope – appeared on the scene, with their huge inventories and rock-bottom prices. The Lees correctly decided they could not compete. Around 1960, the first food items – dry milk and bread – were introduced into the Main Road store. Other groceries soon followed. The now famous Lees meat department began with a second-hand meat case that measured six feet long. Gradually hammers and shoes yielded to breakfast cereals and steak. 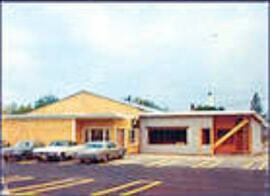 By 1965, with Al Lees, Jr. at the helm, the transition from general merchandise to groceries was complete. In the 1970s and 1980s Lees Supermarket continued to grow. The building spread in all four directions, with addition following addition – twelve times to be exact. A bakery and delicatessen were added. The meat department dramatically enlarged. The liquor store opened in 1981. Each of these expansions involved an element of risk. Failure was always a possibility – success was never guaranteed. The entire story of Lees is one of beating the odds.Finding new ways to serve the customer continued in the 1990s. The checkout registers were computerized in 1994, making Lees one of the first supermarkets in the country to implement this new technology. Frequent shopper cards were introduced soon thereafter, offering buyers discounts and savings on items available throughout the store. Gourmet selections were added to the prepared foods department at the deli. Community involvement and service are watchwords of the Lees organization. Numerous local fund raising efforts have gained from Lees’ commitment of giving back to the town. But community involvement means more than channeling dollars into important local causes. It’s giving countless young Westport High School students their first real chance at a job. It’s finding space on the shelves for local products. It’s providing parents the opportunity to see their child’s crayon drawing of the Easter Bunny suspended from the ceiling. People remember things like that. On February 3, 2014, the next major chapter of the Lees Market story began. After over 60 years under the ownership of the Lees family, the market was purchased by Tracy Anthony of the Clements family. Tracy and her family have a long history in the grocery business. Don Clements, Tracy’s father, worked as the manager of Lees Market in the 1970′s and eventually went on to create Portsmouth’s beloved Clements’ Marketplace. This merger of two of the area’s premier family-run markets has only broadened the community-forward thinking and commitment to quality that Lees has always stood for. With fresh new energy, excitement and enthusiasm, Lees Market moves into the future. Rest assured, what will never change is the Lees Market name and our core business philosophy. It goes something like this: Look for ways to serve your community. Treat people well– your suppliers, workers, and customers. Be willing to take a chance. Try to do something you love. Work hard and everything will turn out right.